I love weeding. A well-curated library collection makes me happy. But weeding can be difficult. We attach a lot of emotion to books. Others don’t understand why anyone would ever want to get rid of books. We have to hide our weeded books for fear of misunderstanding from teachers, parents, students, and administrators. There’s a ton of great acronyms out there to help your weed, but I personally prefer to use data. Numbers are cold, unemotional, and hard to argue with. They can help you defend why you need to clean up your collection (and help you secure funds to update it). No circulation in the last five (ten, fifteen) years. Start sorting your spreadsheet and focus on your criteria. Want to weed 1,000 books? Keep tweaking your limits until you reach the number of books you need to weed (i.e., I’m going to weed every book that is at least 15 years old and hasn’t circulated in 10 years.). Pull those books and weed them. Many vendors, such as Follett, can automatically generate aged title lists for you. If you can, cross-reference this with circulation data to get an even better picture. I’ve weeded books on the e-mail addresses of the rich and famous from 1994, a Microsoft Powerpoint 2001 Manual (in 2017, at a 1:1 iPad school), and books on the Soviet Union that were written during the Cold War. When a title is CLEARLY out-of-date, it’s hard for someone to argue against weeding it. It’s easier to get funds if you tell your administrators that you need to get rid of 75% of your science and technology books because they’re all out of date. You can use numbers such as the recommended number of books per student for your grade level, raw numbers on how many books you have in each Dewey category or genre. Administrators love data, and if you can clearly show them where the needs in your collection are, you’re more likely to find funds. Data is great for grant applications as well. Numbers help to make it very clear what your students are reading. If a book has had zero circulations in ten years, it’s taking up shelf space that could hold something students want. If a particular title has TONS of circulations, that’s a good sign that you need more copies. I’m church librarian for a small church — 40-60 on regular Sundays. I’ve been doing it for ~20 years. We have maybe 120 – 150 feet of books, with ~12 feet of reference books/Bible/Bible Dictionaries, etc. If I used those criteria, I’d have enough books to put on the fireplace mantel. Most books have not been checked out. Ever. Period. At all. And that has not changed since I started. I do have a set of religious fiction books by one author that the ladies must have obtained for a book study. A few have read all the books in the set, most have only read some. The person who trained me, (no I don’t have a degree) talked about having books in different categories — 3/4ths of the collection is in the 200’s. So I’ve looked for conservative and liberal authors, devotions, well-known preachers/writers in our denomination, a minimum on world religions, writings on most of each of the books in the Bible, and classics in the area of religion and philosophy. We also have just been gifted with ~two hundred books on social work, counseling, suicide, depression, listening,etc. from a suicide hotline that closed. I have had compliments from different pastors on having a good selection, which made me feel good. Pastors who like to read have read a lot of what I have. Pastors who don’t like to read — and there have been a few — don’t. Two surveys done in the last 10 years have elicited requests for ebooks (no money) and fiction. Since there are sooooo many authors in religious fiction, I asked them to let me know who they liked. No response. Currently we use strictly author cards, title cards, etc. but we have been given a computer. My goal is to put all the cards on the computer, in the cloud, so people can access the books from home, find out what is in the library, and I could have them ready when they come in. I need a recommended cloud source that people can access from home. And, I don’t have room for the books we’ve just been gifted. I’ve already moved all the children’s books to the appropriate Sunday School Rooms, and spread out the extra sets of Bible Dictionaries for ease of use. Tradition has me putting new books out on display separate from the rest for a couple of weeks. But it’s getting close to where I have work some magic. I know this is not your specialty, but I’m hoping you have some starting points for me. And — where do your books go that you weed? And — Thank you very much. How does one weed books in a fiction section that are mostly accelerated reader books and meet/fit the weeding criteria above? most of my fiction books are “A R” but a majority are not circulated. Great post, Diana! I always did weeding “by the numbers” by running reports in the library automation system, and am always amazed that so many librarians are unaware that they can customize reports to get exactly what they need. Thank you for explaining that so eloquently. At 26 years of age, I became head librarian at a p-12 School. Not my first library but definitely my first time in this role; I only have a library tech degree from about 5 years ago. Buying the books may be my favourite part, and we have a pretty decent budget for our size, but I have been putting the weeding off all year! The non-fiction is extremely out dated and none of it used so i have been really hesitant in adding to it. The librarian before me did weed out a lot that were 15 years old and more but the shelves have been close to empty ever since! I have not weeded any more because then They would be empty but I don’t have any problem weeding the collection; my problem is how to fill it again! I have the same problem in my school as well after we made sure to label all the books with the AR labels. The problem is that even though the books have an Accelerated Reader quiz associated with them, does not translate to interest by your kids. Reluctantly, I have been slowly but surely weeding those books, but not until I have read some of them, or brought them into the light for the students and done book talks. Some have gone on to become popular reads (The Girl With Silver Eyes), and others just too old with dated images. How to replace them with very little money? Donations from parents of their kids popular hard backs, recycling money, whining to the principal and PTA, grants, and picking up popular series from used book stores. WE are the best and ONLY advocates for our libraries. All the librarians in our school district complain about the same thing, if we really weed the shelves will be empty. BUT if you leave dated material on the shelves that is what the kids are learning. One of my friends actually found books about “one day man will go to the moon” on her shelves. How to replace books for very little (no) money? Have a book fair! I just had one and decided to take my profits all in Scholastic Dollars. Because the Fair was over $3000, I got 55% of that amount to buy books from the book fair or other materials from the Scholastic Dollars Catalog. I decided to use it all for books and ended up with an entire book truck overflowing with free books! I based many of my selections on book suggestions from the kids during the week of the fair. So much fun “shopping” and the only thing it cost me was the chaos of a week-long book fair. I can so relate to this post and these comments! We have 2 book fairs a year at my K-8 Catholic school. I am the librarian and I have to host both fairs. It is nice to get the money and books from Scholastic, however it is difficult to just get money to replace worn out books hat need new copies. Scholastic sells newly published books and their catalog has other titles but when I need something from a few years back (Hunger Games, Diary of a Wimpy Kid, etc, I go to Powell’s and get used books that look brand new mostly. My non-fiction section is where old books go to die! I have learned to do all of these things in the last 10 years of being a library aide. We haven’t had a certified librarian on our campus for about 7 years. It has been a learning curve but in a district with 4 elementary campuses, ours being the largest at nearly 700, we have the best book to student ratio, best dated. Me weeding would through my principal into a panic but he now realizes how important it is to shine in comparison to the other campuses. The Follett system is a great tool for those that have it available. 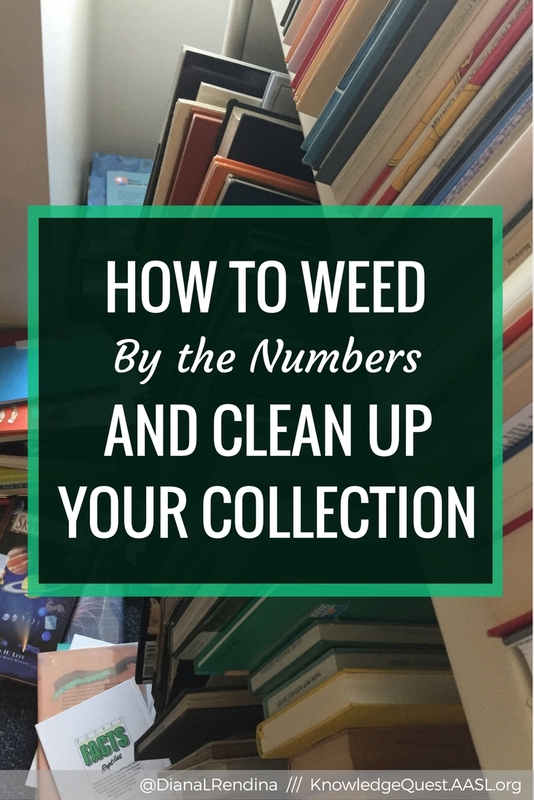 How long does it take to weed 1000 books?